Today we're celebrating America's favorite pastime (or second favorite, if you count quilting as America's true favorite)! 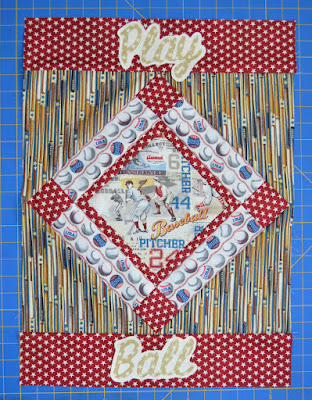 We've used the vintage baseball-themed prints from the Play Ball collection by Bristol Bay Studios to create a mini wall hanging. 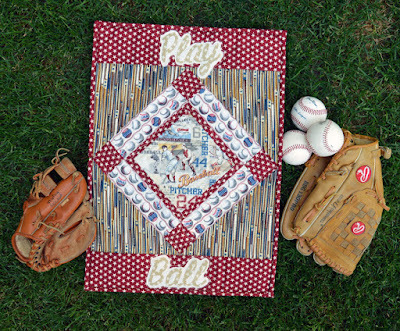 Quilt measures approximately 16" x 22"
Click here to download the pdf with the "Play Ball" words. 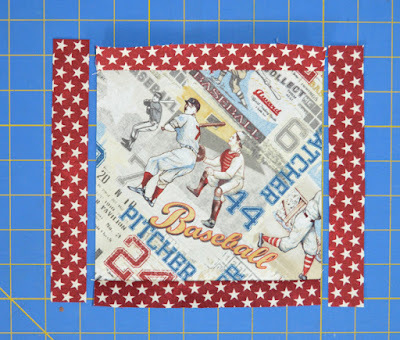 Step 1: Sew 1" x 6-1/2" red star strips to opposite sides of the 6-1/2" allover baseball square. Sew 1" x 7-1/2" red star strips to the remaining sides. 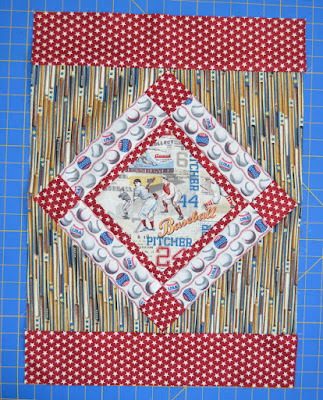 Step 2: Lay out four 2-1/2" x 7-1/2" baseball stripe strips and four 2-1/2" red star squares around the center square as shown. Sew baseball stripe strips to opposite sides of the center square. 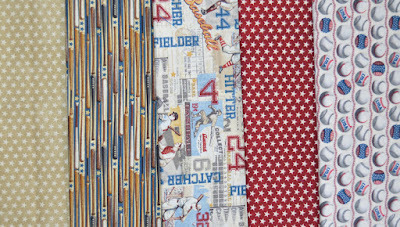 Sew red star squares to both ends of the remaining baseball stripe strips. 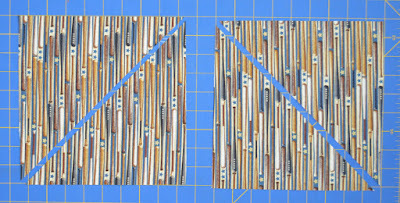 Sew these pieced strips to the remaining sides of the square. Step 3: Cut one 8-3/4" bat stripe square diagonally in half from lower left to upper right. 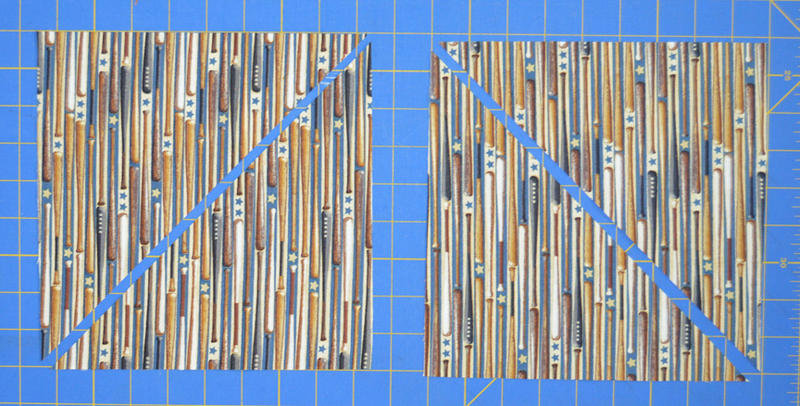 Cut the second 8-3/4" bat stripe square diagonally in half from upper left to lower right. 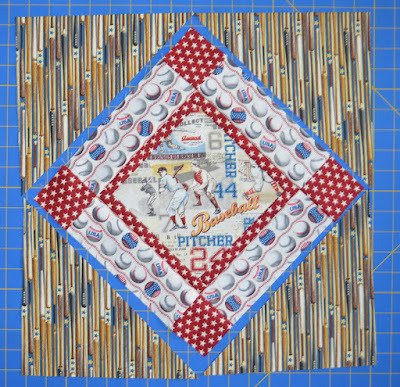 Step 4: Lay out the bat stripe triangles around the pieced square as shown, so the bats are all running the same direction. Fold each triangle in half and mark a crease at the center point of the long side of the triangle. Mark the center of each side of the center square as well. 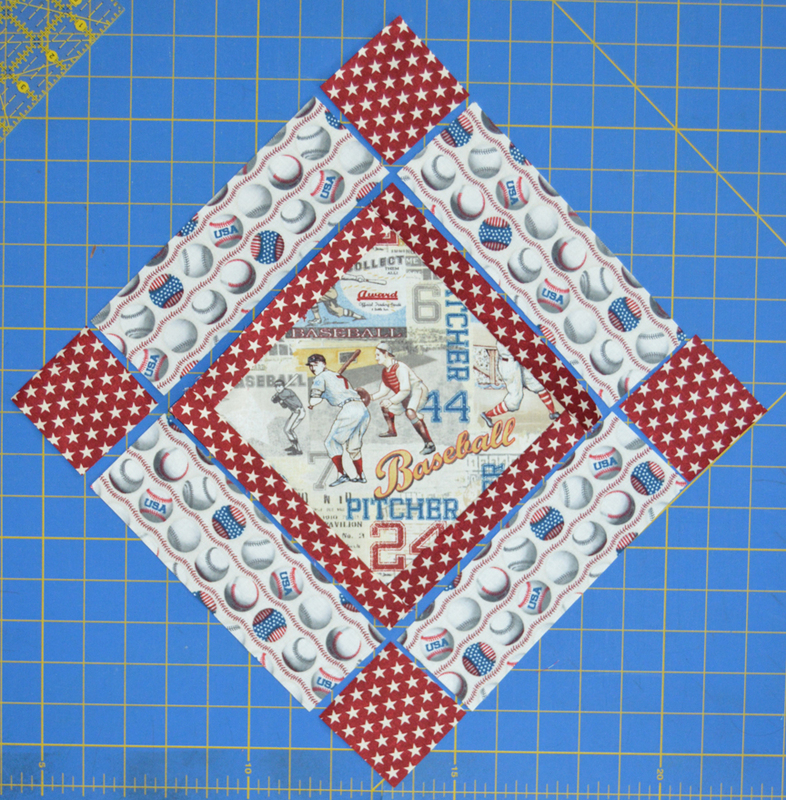 Matching the center marks, sew triangles to opposite sides of the pieced center square. Press triangles out. Sew triangles to the remaining sides. Step 5: Trim quilt center 1/4" past the red star points, approximately 16" square. 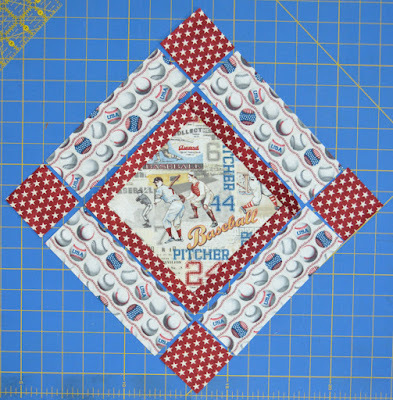 Step 6: Sew the 3-1/2" x 16" red star strips to the top and bottom of the quilt center. 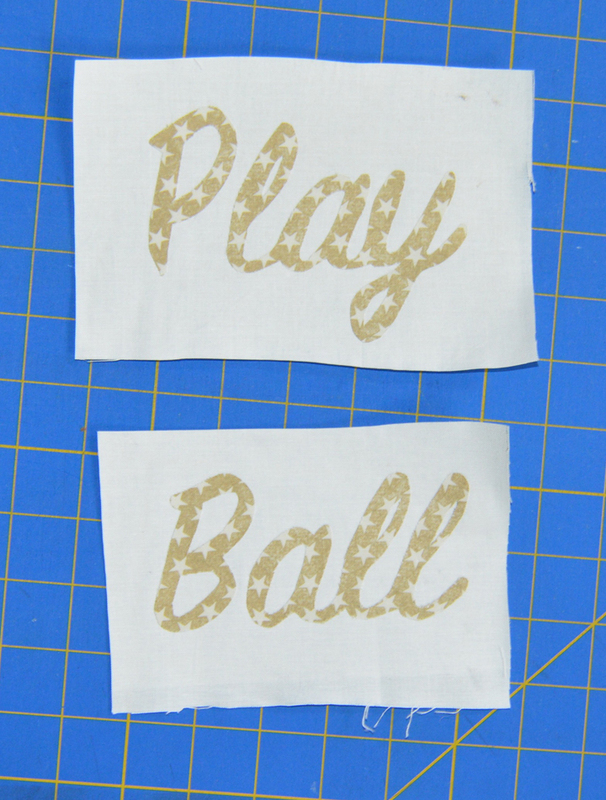 Step 7: Print out the "Play Ball" template and trace onto the paper side of fusible web. Fuse to the wrong side of the beige star print. Cut out the letters. Adhere fusible web to the back side of one 10" cream square. Cut in half to make two 5" x 10" pieces. Fuse the words "Play" and "Ball" to the cream pieces. 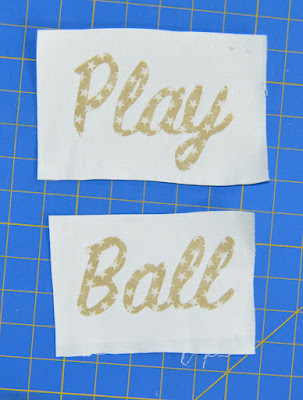 Step 8: Cut out each word approximately 1/4" past the beige print to create a cream outline as shown. Step 9: Fuse the words to the top and bottom of the quilt as shown, centering from left to right. Step 10: Layer the backing, batting and quilt top right side up. 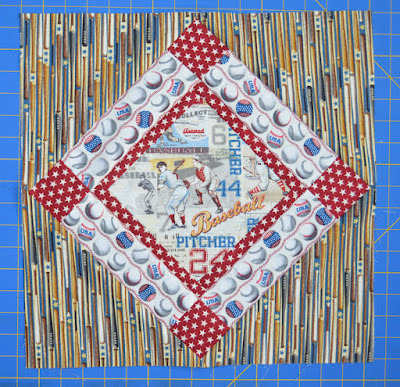 Baste layers together and quilt as desired, stitching the appliques down to secure as well. 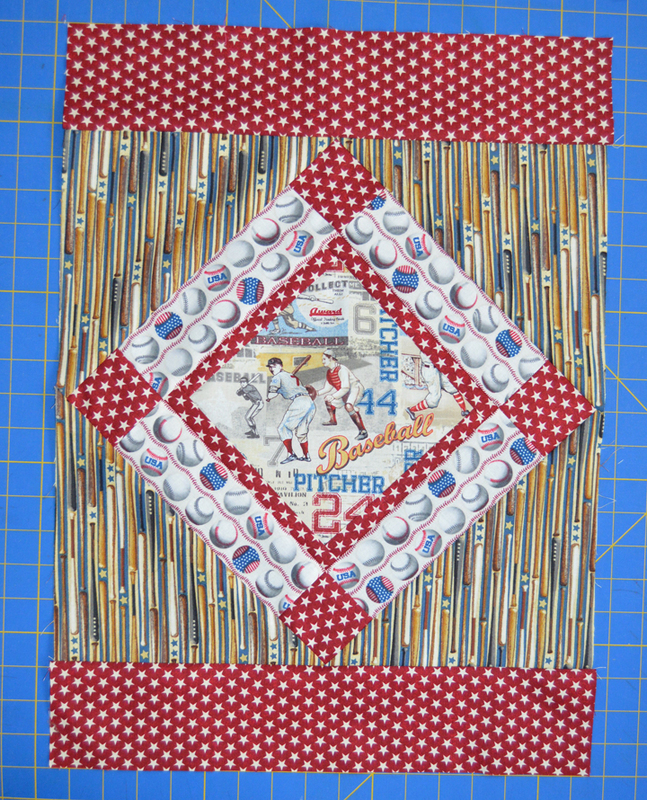 Trim the backing and batting even with the quilt top. 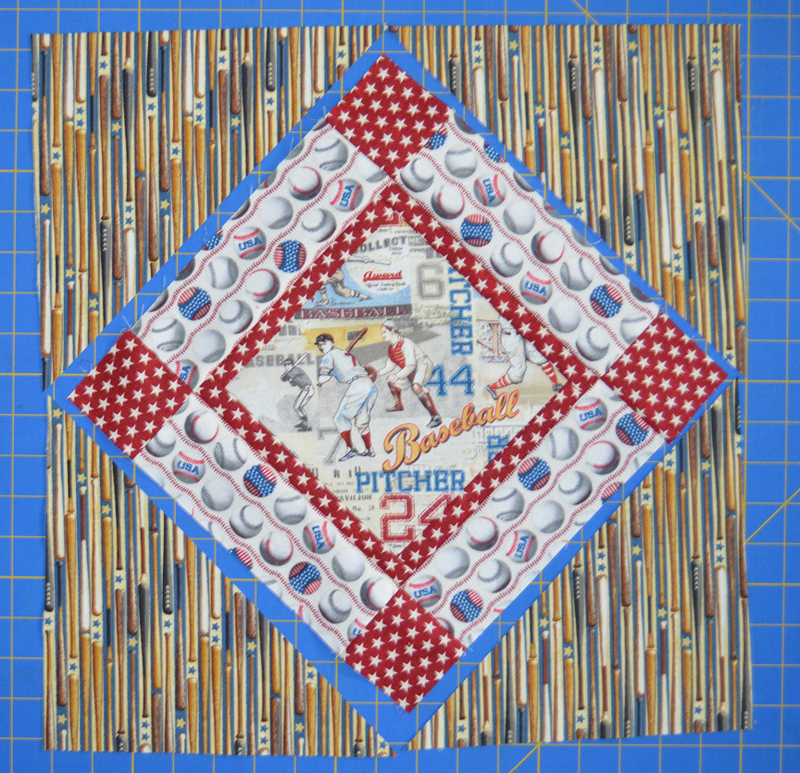 Use the two 2-1/4" x 42" red star strips to bind the quilt. 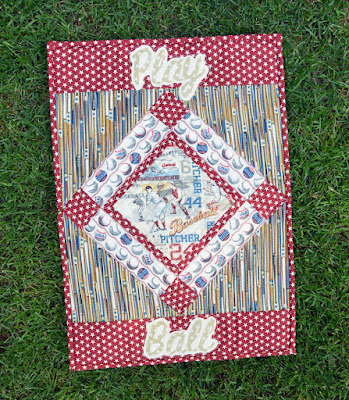 Click here to see the entire Play Ball collection. 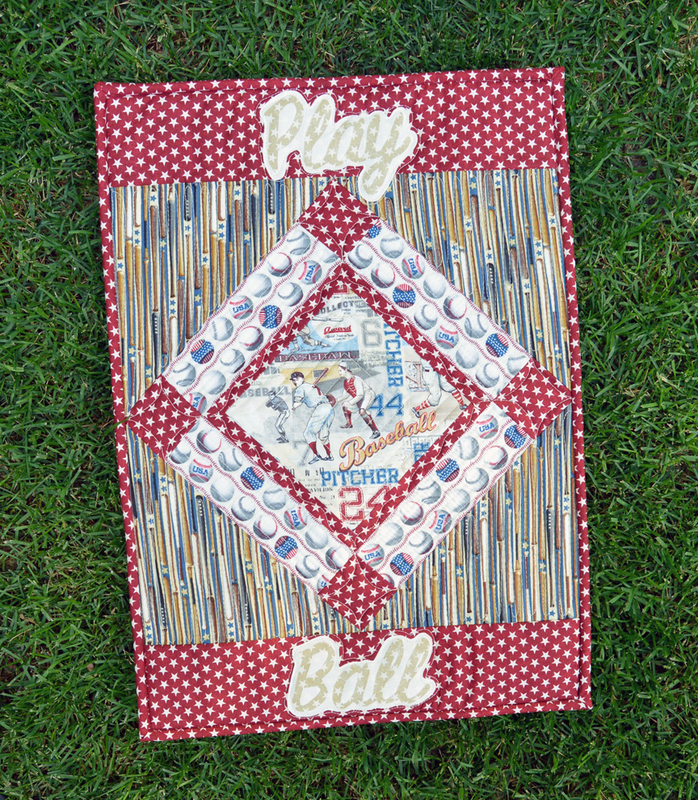 For a chance to win a bundle of Play Ball fabrics, make sure you follow us on social media--blog, FB, or IG. Leave a comment below letting us know how you follow us, and telling us your favorite thing about summer. Giveaway is open through Friday, May 19th at 11:59 pm EDT. So beautiful and the fussy fabrics are fantastic.Great job!! I do follow by email and facebook. I follow via Facebook and email. Summer is fun as we get to open up our windows for some fresh air, wear lighter clothing. 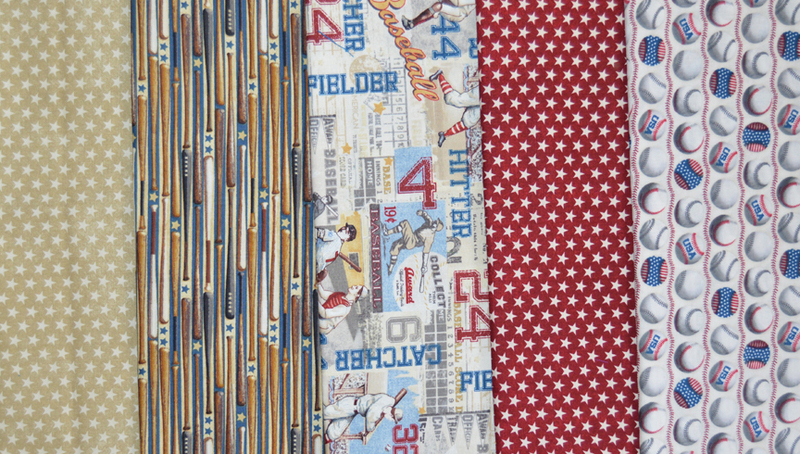 Love these fabrics - great for sports-themed projects. I follow your blog via GFC. One thing I love about summer is all the delicious fruits and vegetables that are in season. Clever design - great for both girls and boys! 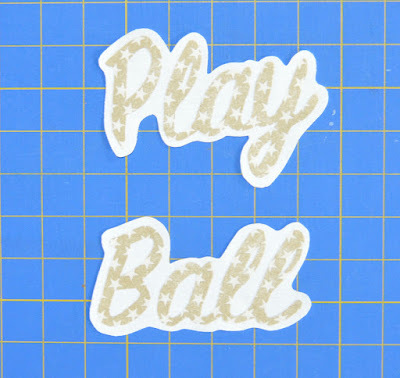 But I can not see the Play Ball template link anywhere.... - Am I missing it? I follow you by email and love the posts. Favorite thing: eating ice cream without freezing to death! I follow via e-mail, Facebook and Instagram. My favorite thing about summer is appreciating all of Mother Natures inspiration. My favorite thing about summer is reading in the sunshine! I follow your blog via email (wordygirl at earthlink dot net). I follow by email. My fav summer activity is sitting on the deck slow stitching with a beverage or two! My favorite thing about summer is all of the fabulous outdoor craft projects that I get to do! I follow by email. Summer love = the beach 🌊! Following by email! I like seeing all the flowers bloom! I follow by email. FLOWERS+NEW BIRDS VISITING ARE MY FAVORITES! FOLLOW YOU ON FB! THANK YOU! I follow you on Facebook. Thanks for the chance to win! My favorite thing about summer is simply being outside without a parka! I follow on FB and blog by email. Cute design. I'm looking forward to traveling and cookouts. I follow your blog by email and I absolutely love the longer daylight hours. This way I can get sewing done before going to work! Yeah. I follow by IG and email. I love summer cookouts with friends, and having the windows open for fresh air! My favorite thing of summer is getting to see more of my grandkids. I follow your blog with bloglovn and I love summer Det Tiger baseball games! thanks! I really love the mini quilt. It would look so awesome in a little boys' room. What I like about Summer are all the pretty flowers, long days and ICE CREAM. I follow on Bloglovin. Thanks for the giveaway. I love the summer fruits. There is nothing like the sweet taste of a tree ripened plum, or peach, or nectarine! Love the mini, it's a clever use of the fabric line. Thanks for sharing your abundance! My favorite thing about summer is our garden. I can't wait to eat those tasty veggies!! I follow your blog via Bloglovin. I follow you via Bloglovin. My favorite thing about summer is having my grandchildren visit. I follow you on Bloglovin'. Looking forward to gardening in the summer. My favorite thing about summer is warmer, sunny weather! Bloglovin follower & facebook follower: Nicole Sender. I follow you via FB, IG, and email. I HATE summer because the temps are so brutal (usually), although getting through summer does get me closer to winter! LOL! Please click on the delaineelliot above for my email link. Bloglovin' for me. and Bare feet! I am a follower of yours on Bloglovin. I love having the freedom to do what I want during the summer and having no schedule to follow. I have enough of that during the school year. Following via Bloglovin and email. Baseball games of course! favorite summer time fun! 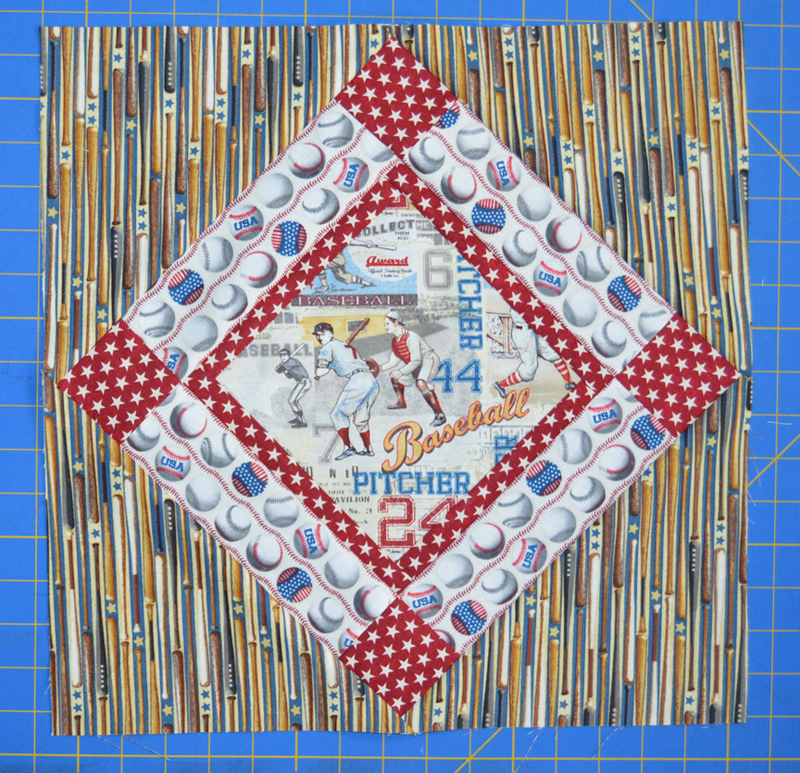 Thank you for a fabulous tutorial and there are plenty of baseball fans in my family who'd love this mini. I just found this blog! Looking forward to following now!